That’s our snake catching crew, in the southern India countryside outside the town of Chennai, after having successfully bagged our first wild Cobra. Or at least my first wild cobra. J. Raja, his sidekick as well as the rest of the Irulas Tribe of Tamil Nadu have long been hunter-gatherers on the hot, dry plain-forests, practicing the art of snake catching for generations. Highly venomous snakes are caught with the help of a simple stick, and managed as I witnessed with bare hands and a rough metal scythe. Catching thousands of snakes for the former snake-skin industry, India’s Wildlife (Protection) Act of 1972 protected snakes and banned the former practice country-wide, inspiring the formation of groups like the Irula Snake Catcher’s Cooperative. 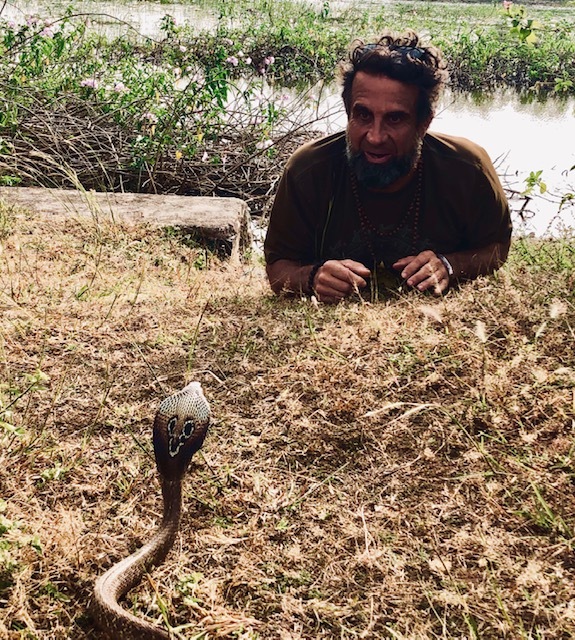 Card carrying members like J. Raja switched to snake catching for biomedical research and producing medicinal products, the removal of venom producing life-saving anti-venom, with captured snakes released back into the wild after four extractions. The Irulas are also known to eat snakes and are very useful in village rat extermination. More on the contribution of snake men to the greater good when we get back to the snake farm, Herpetology Headquarters, officially known as the Madras Crocodile Bank Trust Centre for Herpetology. But how we side-wound our way there and even found these guys in the first place is a whole other story. As Sarjan, my trusted guide on the Cobra quest well informed me: “In India and in our Hindu mythologies you’ll find there is always the story behind the story.” And there was, a winding tale to that ecstatic, exotic morning we literally bagged with a pillow case a wild Spectacled Cobra, or Indian Cobra (Raja Raja), our “lucky” find coming only after my second eight-thousand-five-hundred-four-mile jaunt to the Indian sub- continent. Per the previous post, I kidded my friend Rajiv of Mystical Journeys that I couldn’t in good conscious return to India for a second time and fail to cross paths with the cobra, given my love for snakes coupled with the animal’s role in human history and ritual, its impressive, threatening, hooded stance and renowned ability to kill a human with a single bite. In India, 250,000 snake bites are recorded annually, on the order of 100,000 people dying each year. These were some of the facts learned at the very start of the snake tour, beginning at the Chennai Snake Park — officially the Chennai Snake Park Trust. Along with other indigenous reptiles, the park displays a collection of captive snakes with an unblinking eye toward fostering interest, education and empathy toward the singular species. Awareness is spread among the public on India’s snake conservation and anti-snake bite efforts, as well as the history of real Snake Catcher cooperatives. I enjoyed learning of facts like the establishment of the Big Four — the four venomous snakes responsible for causing the greatest number of medically significant human snake bite cases in India — our later catch of the Spectacled Cobra being one, along with the Common Krait, Saw-scaled and Russell’s Viper. As an interesting aside, that species was named for Patrick Russell, an 18th century Scottish herpetologist who first described many of India’s snakes, the name of the genus (Daboia Russelii) from the Urdu word meaning “that lies hid” or “the lurker” a spooky but apt title. I even had my first brush with a real cobra at the park as well as a genuine Tamal snake man, who lead a show for visiting Indian school children, displaying harmless as well as poisonous specimens and canvasing public support for snake protection amongst the young. Still the nagging thought persisted that I didn’t travel all the way back to India a second time to see a Cobra at a zoo. Doubts raised their hooded heads, as Sarjan fielded several calls from different potential snake hunters, revealing our plans to be… murky at best. One was away, one snake catcher was feuding with another (funny), everyone making it very clear that January was not high Cobra season. Its understandably hard to pin both snake and snake catcher down this time of year, as you’d be hard-pressed to find a Diamondback Rattler in Arizona during the chilly winter months, with the same natural law here. Sarjan shared his semi-reliable back-up plan, that of a contact in Varanasi who owned a “Big cobra man”. But, learning as I went along, my original hope to see and hold a basket cobra — half the infamous roadside show, performed also by a flute-like musical instrument player who seemingly charms the snake to music – had significantly shifted. Snakes actually lack external ears, though they do have internal ears, the response being to movement and not noise. But those city snakes are defanged and turned out to be a bit depressingly domesticated. Sure, they were cool to touch and emulating Shiva with one round the neck and over a shoulder was fun, but catching the wild cobra became The Mission. And if anyone was going to prove a reliable guide it was mystical journey man Mr. Kumar (Rajiv Rajiv). Maybe a semi-dark, somewhat obscure plan was best when hunting the notoriously clandestine shape. With that in mind, we set out in the pre-dawn hours to meet the snake catchers, embarking together from the quiet, gated Herpetology Centre into the countryside. Our crew sauntered along what looked like rows of Eucalyptus trees, the hunters poking at the brush underneath. We traversed farmland and rice fields, crossed waterways, dug into huge, hip-high dirt termite mounds, overturned downed trees and kicked at piles of cut, dying shrubbery. The walk was pleasant as the sky brightened, hopes kept in check, knowing well how some big expectation would kill the experience. We tried some conversation, J. Raja as a non-Hindi speaker billing himself as semi-fluent in English, which wasn’t exactly the case. Inquiring of his history — how long had he been snake wrangling, was he ever bit, what then? — were all answered in his native tongue interspersed with bits of English. “Yada yada yada four hours, four hours yada yada” he would say emphatically, pointing to a bite scar on his hand, with me basically deducing (with some help from Sarjan) that one had four hours to live if bit. Questions like “Did you take anti-venom? Were you hospitalized?” were met with “Yada yada yada one month’s rest yada yada.” Despite the language barriers and off-season logistics, the search was ON, the snake-catchers being dogged in their pursuit of digging, scratching at and overturning the landscape. While enjoying the hunt, after miles walking and several hours, it appeared we were coming up empty-handed, and so the convoy turned and began making its way back to the home Centre. Thinking back on it all now, it was one incredible moment of ecstasy. Afterwards I felt wiped out, like I’d just made love - content, calm and basking in the afterglow of an farfetched sensorial experience. We pillow-cased the catch, took some trophy pics and made a triumphant return to the snake farm. At least triumphant for me, perhaps all in a day’s work for my comrades. There the snake would be turned over to Morrey along with a half-dozen another real, hard-core snake men, all who wielded the big Four around with such ease, they had me voluntarily abdicated my former status. Over breakfast, I considered the bad rap snakes have had through the ages, and the connection to and reverence for the natural world that we’ve somehow lost. But we can regain that sense of awe. And in that way, maybe snakes are a good place to start over, resetting our fears and misperceptions and in a way rediscovering Eden. With that, we’re back, on the lookout for Michigan’s only poisonous snake the Massasauga our own local “lurker” with some final notes from the road along with specifics on our upcoming Spring and Summer schedule at the start of April. Once upon a time I fancied myself a snake man. Have you ever met a snake man? A dude slightly obsessed with the scaly, legless, sometimes venomous reptiles of the suborder Serpentes? Snakes on the brain, like male Medusas. They’re out there. And I know a few good ones, this being the tale in part of why I no longer consider myself an honored member of their ranks. But first let’s go back to the beginning, the place where the snake, right from the get go, caught a notorious rep. In my own life, as far back as I can remember, the gold-red ribbon of a Garter Snake or the flash of a Blue Racer’s sapphire sheen always warmed my blood. The first decent story I ever wrote was all about time spent on the hardpan of Arizona’s Sonoran Desert, licensed by the state to remove rattlesnakes from people’s yards. Like a self-dubbed Snake Sheriff, I kept the peace between the local snake population and local female people population. The sub-title of that story Snakecharmer was originally How My Love for Rattlesnakes Cured Me of My Fear of Women - a black and white tail of somewhat creative non-fiction, as I really did live with a Diamondback Rattlesnake that hibernated in my fireplace one Southwest Winter. As a Snake man then (or former one) you can understand my disappointment in traveling for the first time to India - King Cobra Country - and returning without having seen a single Shape (Snake in Hindi). That first tour of the Hindu world was a TRIP in the truest sense, an odyssey organized by Vedic Astrologer James Kelleher - incredibly learned in the ancient art of mapping a soul’s journey by the light of the stars. The trip was lead by Rajiv Tomar of Mystical Journeys, from The Taj Mahal to the Holy, Crazy city of Varanassi and down to temples all over the country’s southern tip. Mystical Journeys, with their emphasis on spiritual, cultural and adventure travel in the country, in their own words, “Leads the traveler to a new horizon where astrology, culture and adventure meet.” Their mind-blowing network of educationalists, spiritualists, Saints & holy people, guides and other teachers comes down to Rajiv’s connectedness. the man, along with his son Caran and second-in-command Sarjan Kumar and other trusted foot soldiers. On that first trip, I watched Rajiv confront a police officer on the streets of Chennai - some altercation that was effecting our group’s safe passage - that earned him the nickname The Bengal Tiger. As to impressions of the man, I’ll borrow George Bernard Shaw’s take on Gandhi - you might as well ask for someone’s impression of the Himalayas. It was in conversation with Rajiv on the bus after a particularly intensely joyful experience at Rameswaram’s Arulmigu Ramanathaswamy Temple that a Cobra Tour was first concocted. “That was !ncredible !ndeed,” I beamed. “And I can’t wait to see the cobra.” His face fell - he explained we had passed the places to see the traditional basket-cobras dance to the flute. I could hardly express disappointment, the trip was so extraordinary, and so responded “I just love seeing wildlife and especially shapes.”. And of course Rajiv’s twinkle was back minutes later, as he offered, “Then you’ll just have to come back to India!” And although it was a comical, creative idea between two new friends then, a year later, this February, I was back, to attend Kumbh Mela, the mass Hindu pilgrimage of faith in which saints and sadhus all gather in millions to bathe in the Holy Ganges River along with a Southern India Cobra Hunt on the itinerary. Slither back soon for How To Catch A Cobra (Part 2) - The Tale - to come. Laos KAPOW addressed my original overjoyed response to the exotic Luang Prabang experience. En route home, a New York Times article brought to mind the unfunny underside of Onomatopoeia: Hidden Calamity in Yemen’s Civil War: A Million Land Mines read the headline, with an accompanying photo of a ten-year-old Balda, Yemen boy who blew off his lower left leg while playing. The caption read “Mines have killed 920 civilians and injured thousands,” detailing how millions of inhumane weapons carpet the landscape. Rights groups and other monitors say the minefields will leave Yemen riddled with buried explosives that could kill or maim unsuspecting civilians for decades before the devices can all be removed, as they have in Afghanistan, Columbia and Laos. 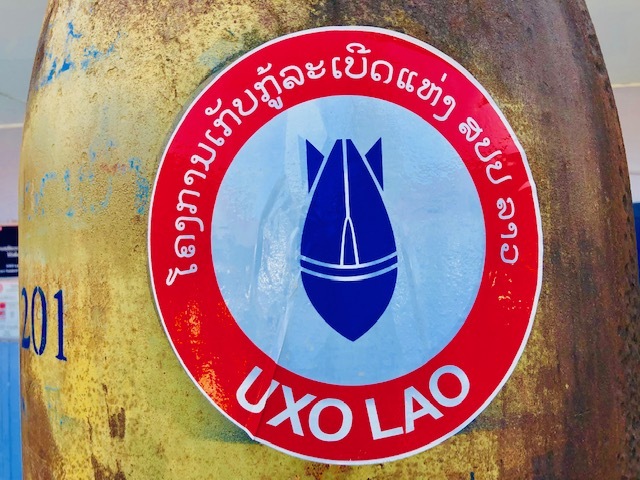 Luang Prabang’s UXO Information Center and Laos Unexploded Ordinance Program turns the dark side of Laos’ Secret War to the light. From roughly 1964 to 1973, the U.S. dropped more than two million tons of ordnance on the country. During 580,000 bombing missions, a planeload of bombs fell every 8 minutes, 24-hours a day, for 9 years – making Laos the most heavily bombed country per capita in history. The bombings were part of the U.S. effort to support the Royal Laos Government against the Pathet Lao – closely tied to the communists of North Vietnam - and to interdict traffic along the Ho Chi Minh Trail. Many villages were destroyed and hundreds of thousands of civilians displaced. Of the over two million tons of cluster sub-munitions or “Bombies” dropped, over 30% failed to detonate, leaving 80 million unexploded bombs across the landscape of all 17 of Laos provinces. Over 20,000 people have been killed or injured as a result of UXO accidents in the post-war period, 1974-2008. UXO Lao works in the country’s nine lost heavily contaminated provinces. Learning of and remembering the Laos people’s plight, I felt grateful being Home, well appreciating the security enjoyed as a resident of the states, and being more keenly aware of it after experiencing lands less free.